The Christmas season wouldn’t be complete without the delightful and happy songs we grew up listening to. Some people play them just after Halloween while others wait until December before starting to blast them in their cars and at home. There are few people who play the songs as early as September. Because Christmas songs are extremely popular, it’s not surprising to find different versions of the same songs. From popular music celebrities to new and aspiring singers, each has his or her own take on the song and that makes the melodies and rhythms a lot more delightful to the ears. Jared Halley, however, took his rendition of the most popular Christmas songs to a whole new level. Jared Halley, a popular musician and producer who makes videos on YouTube, created an a capella mashup of the top 5 Christmas pop songs. His video was set up in what seems like a family living room, complete with a piano and Christmas tree. The location certainly added warmth to his video, and anyone who watches it will feel that the Christmas season is really upon us. 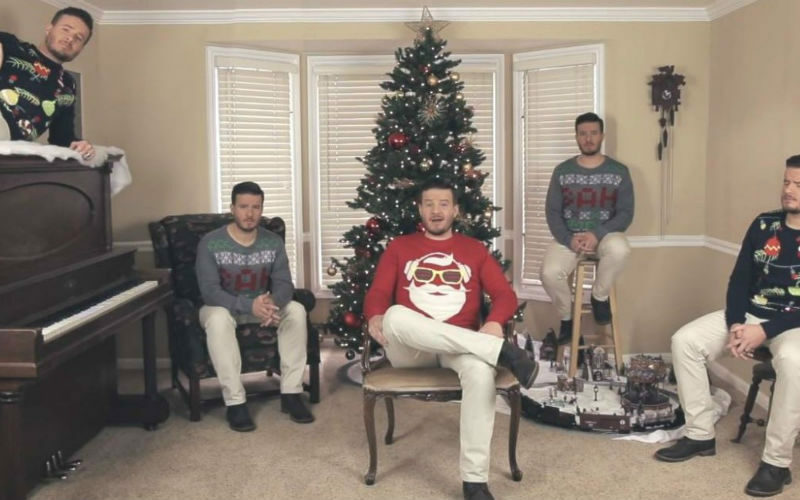 In the video, you can see not one – but 5 Jared Halleys – all dressed up in cute Christmas themed sweaters. Each Jared has a unique part in the classic tunes. One was singing while the rest were playing different beats to bring the songs to life. One of them was at the top of the piano while the other 4 were seated. And just as they played the well-known “Rockin Around the Christmas Tree,” two more Jareds appeared from behind the tree. It was certainly a surprise that made the performance a lot more entertaining! In his video, he also sings “So This Is Christmas,” “Last Christmas,” “Santa Claus Is Comin’ to Town,” and “All I Want for Christmas Is You.” At the last part, he impressively sings all of the songs again. Jared Halley stands out for the way he produces music. Using only his mouth and voice, he’s able to recreate sounds. And by adding percussion elements like claps and stomps, he can create an incredible a cappella masterpiece.